Has interchangeable outfits and communicates in squeaks. Japanese startup Groove X, founded by an alumni of SoftBank Group Corp’s robotics unit, unveiled its first creation on Tuesday – a companion robot designed to make users happy. The Lovot, an amalgam of ‘love’ and ‘robot’, cannot help with the housework but it will ‘draw out your ability to love,’ Groove X founder and CEO Kaname Hayashi told reporters at the launch in Tokyo. 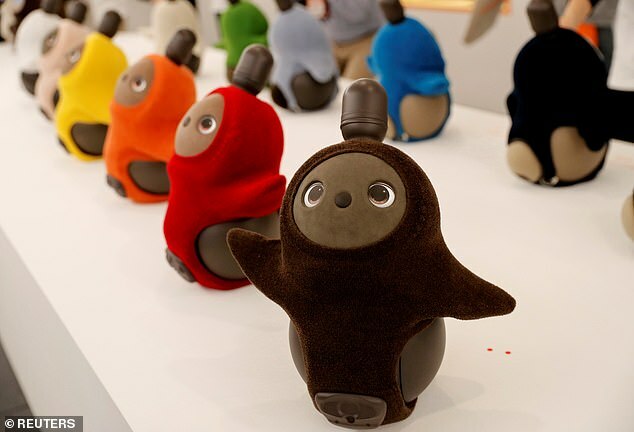 Using artificial intelligence (AI) to interact with its surroundings, the wheeled machine resembles a penguin with cartoonish human eyes, has interchangeable outfits and communicates in squeaks. Groove X’s Lovot robots are displayed at their demonstration during the launch event in Tokyo. Using artificial intelligence (AI) to interact with its surroundings, the wheeled machine resembles a penguin with cartoonish human eyes, has interchangeable outfits and communicates in squeaks. It is designed to mimic affection for users who show it kindness by becoming warm to the touch, going to ‘sleep’ when it’s cuddled or following users when called. Its practical uses are limited to simple tasks like baby monitoring or watching over the house via a camera that users can access through a mobile app while they are out. While Japan is already a leading manufacturer of industrial robots, Groove X is trying to expand the fledgling market for household robots. It has raised 8 billion yen ($71.1 million) from investors including a Toyota Motor Corp-backed fund , chat app operator Line Corp and the Japanese government. The Lovot will compete with Sony Corp’s AI-powered robot dog Aibo, revived last year more than a decade after it ceased production. Hayashi worked on SoftBank’s humanoid Pepper robot, which can be found greeting customers in shops and restaurants across Japan but has been a flop with households three years after its launch. SoftBank has recently increased its focus on more practical robots, last month launching the Whiz autonomous cleaning machine which uses technology from portfolio company U.S.-based Brain Corp.
As with Pepper, Lovot’s uptake is likely to be hampered by its hefty price tag of 349,000 yen ($3,100) before tax with ongoing subscription fees. Units will start shipping in late 2019. Japan ranks lowest among the G7 highly industrialised nations in the United Nations annual happiness ranking.